At SAM Gas Projects, we design and build fully-automatic plants that generate hydrogen. Our hydrogen plants are compact and cost effective. Our hydrogen generators are not only easy to operate, but also maintenance free. Hydrogen Generators We are engaged in manufacturing and supplying a quality range of Hydrogen Generators that is well known for their performance and high productivity. These generators generate hydrogen gas by electronic technology. With the help of our expertise and in-house manufacturing facility, we are able to offer our clients with various Pressure Vessels, Reactors, Absorbers, Columns, Heat Exchangers and Tanks. Further, we also fabricate high quality equipment for Gas Generation, Gas Drying and Gas Purification Systems. 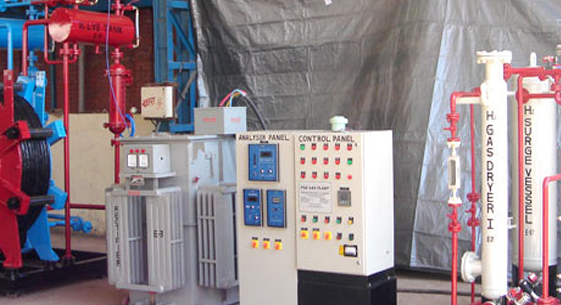 These equipments can be skid mounted and may be operated through PLC. Available in various technical specifications, our range is in high demand by our clients spread across the globe and is offered at industry leading prices. This method generates hydrogen through Electrolysis (bipolar type) along with gas boosters and de-oxo units. Electrolysis dissociates the elements of water (oxygen and hydrogen) by charging water with electrical current. The amount of power consumed by these plants is 4.5 KW (per cubic meter of hydrogen). The hydrogen obtained is collected in a hydrogen gas holder and is further used for processing. Though hydrogen obtained through electrolysis is 99.8% pure, the use of de-oxo units helps in purifying it further (up to 99.999%). Chemical Industry : Hydrogenation process & animation synthiss. Oil & Gas Industry :The design and Instrumentation makes the plant size very compact, assembly on skids, prefabricated and supplied from factory. Heat Treatment Industry : Reducing protective atmosphare. Glass Industry : Protective atmosphare for casting float glass on molten metal bath. Electric Industry : Protective atmosphare for manufacture of eletronic component. Used as a shielding gas in welding methods such as atomic hydrogen welding. Liquid H2 is used in cryogenic research, including superconductivity studies. It is used pure or mixed with nitrogen gas (sometimes called forming gas) as a tracer gas for minute leak detection. One can be find in the automotive, chemical, It is used pure or mixed with nitrogen gas (sometimes called forming gas) as a tracer gas for minute leak detection. One can be find in the automotive, chemical, power generation, aerospace & telecommunications industries. Hydrogen being an authorized food additive that allows food package leak testing among other anti-oxidizing properties.